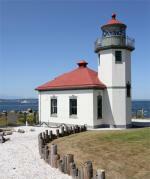 For a fun, active day along the beach, head to Alki Beach Park in West Seattle. This beautiful little strip of land is accessible from Seattle Southside by driving north on I-5 and crossing the West Seattle Bridge and taking the Harbor Avenue exit. Or you can take the light rail from Seattle Southside to the Pioneer Square Station and walk down to the waterfront and take the Water Taxi for $4.75. With paved trails along the entire beach this is a perfect running, walking, biking or rollerblading route. Parking is available on the side of the street but try to arrive early as this fills up quickly on a sunny day. To make sure we started off our adventure right, we first headed to Marination Ma Kai, a little restaurant with amazing views of the downtown Seattle skyline and ferry boats crossing the bay. After enjoying some tasty Hawaiian-Korean food and shave ice(! ), we were ready to begin despite some nerves about not having rollerbladed since elementary school. If you do not have your own gear you can rent your rollerblades, helmet and pads from Alki Kayak Tours. They also rent paddle boards, kayaks and bikes for endless amounts of fun on and along the water. For $10, we rented our gear and strapped in for a two-hour adventure. After taking a few slow practice laps around the shop, we rolled out. The sidewalk is wide and flat and makes for an easy ride. Along the way we spied sand volleyball players hitting and digging, kids splashing in the small waves, families enjoying picnics and bar-b-ques, and many games of catch. We bladed down to the Alki Lighthouse on Alki Point and stopped for a free tour and then turned around to head back as our two hours were nearing the end. Our total distance covered was about 5 miles. Once our gear was returned we walked back along the beach and stopped to relax on the sand and dip our toes in the water. By then we were nice and thirsty so we hit up Cactus for happy hour on the patio and enjoyed chips and fresh guacamole and margaritas. We leisurely strolled back to the loading dock and hopped on the water taxi while enjoying a beautiful sunset.